1959. 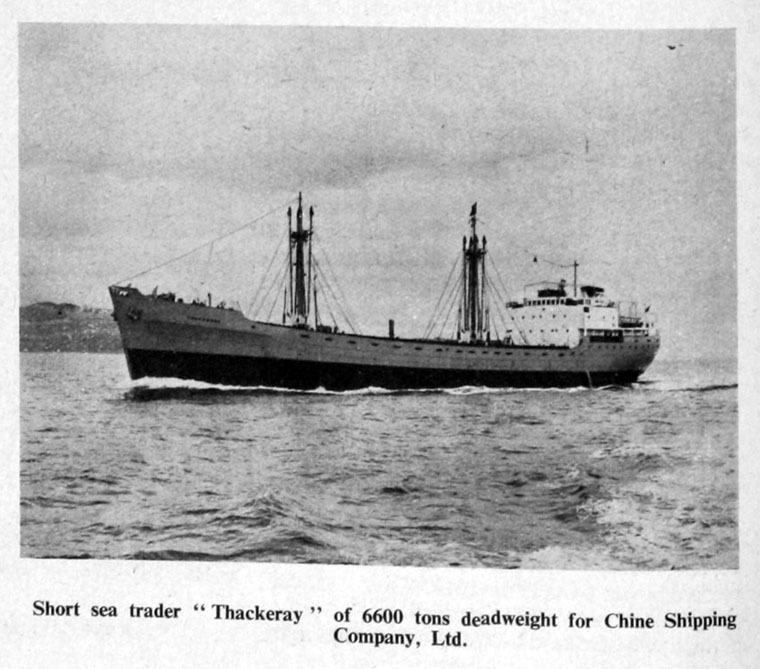 Short Sea Trader "Thackery", 6600 Tons dead weight, built for the Chine Shipping Co.
Henry Robb Ltd, known colloquially as Robbs, was a British shipbuilding company based in Leith Docks on the east coast of Scotland. 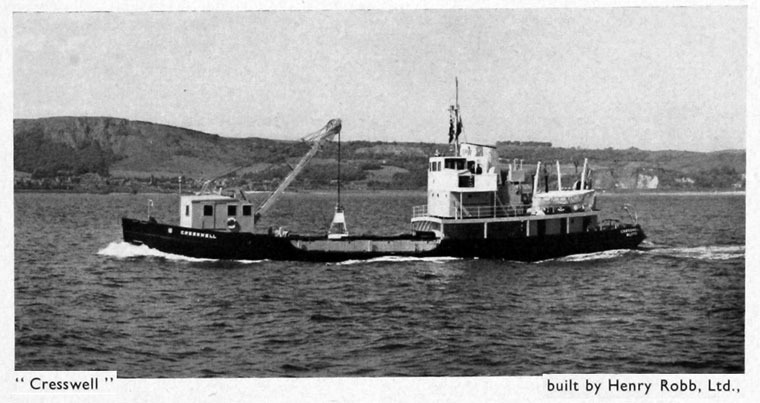 Robbs was notable for building small-to-medium sized vessels, particularly tugs and dredgers. 1918 Henry Robb started his career as a yard manager for Ramage and Ferguson. Following the war he leased dry-docks and went into business for himself on 1st April 1918. His company’s main activity was repairing ships damaged in the war itself. 1924 Robb bought the shipyard and two berths of Hawthorns and Co.
1926 Henry Robb bought the Crane and Somerville yard which was almost adjoining them. 1920s The company started by making dredgers, followed by coasters and steamers. The company managed to ride out the Depression thanks to a constant supply of orders, although it did experience a lull. 1930s Steamers and steam colliers were the main output for the yard along with coastal colliers. The Union Steamship Co. of New Zealand made the first of many orders in the 1930s and became a very important customer for the yard. 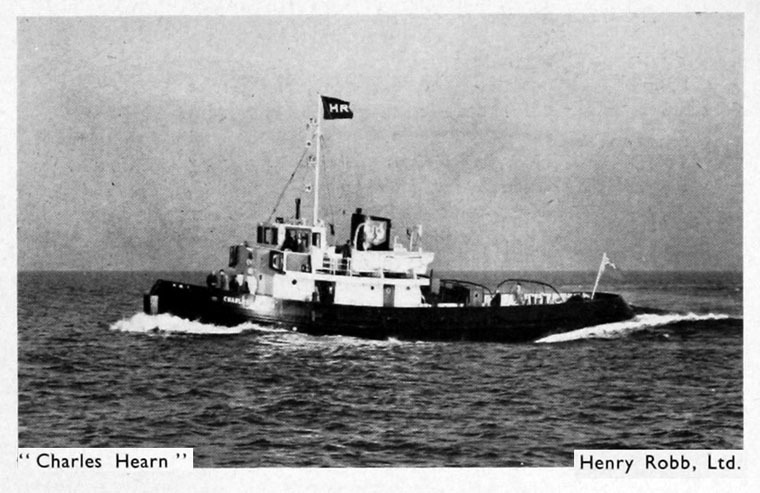 1934 A further yard was acquired by Robb's having previously belonged to Ramage and Ferguson This took Henry Robb’s berth numbers up to eight all of which could launch directly into the sea. 1950s The Union Steamship Co. of New Zealand ordered over twenty motor coasters during the 50s with a number of steamers, coasters, Mediterranean traders and mini cargo-liners being made for other companies. 1960s The berths expanded again and Robb’s constructed a lock at the entrance to Leith’s Outer Western Harbour, which allowed deeper ships to be made. During the 1960s a helicopter ship was made along with coastal tankers and a number of naval tugs. 1961 Shipbuilders, ship and marine engine repairers and builders of small ships of specialised types including passenger and cargo liners, ocean-going tugs, harbour tugs, dredges and other small specialised craft. In 1968 the Dundee yard of the Caledon Shipbuilding and Engineering Co was taken over and the 2 yards at Leith and Dundee began trading as Robb-Caledon Shipbuilders. The Leith yard then went on to build cargo ships, Antarctic research ships and roll on/roll off vessels as well as smaller car transporters, a wine tanker and a grab dredger. 1970s A large deep sea tug was commissioned by the United Towing Co which was followed by two others and salvage vessels. In addition, survey vessels, liquefied gas carriers and a collier were manufactured. 1980s The Caledon yard in Dundee closed down in 1981 due to lack of orders. The Leith Yard continued building: a passenger/vehicle ferry, a dredger, two crane barges, two oil rig supply vessels, two tugs, a lighthouse and two ferries. The second of the two ferries, named St Helen was the last ship launched form the yard of 15th September 1983. 1984 The yard ran out of orders at this point and closed in early 1984. This brought to an end over 600 years of shipbuilding in Leith. The land once occupied by Robb's shipyard is now the Ocean Terminal shopping centre, home to the Royal Yacht Britannia. This page was last edited on 30 March 2016, at 17:15.